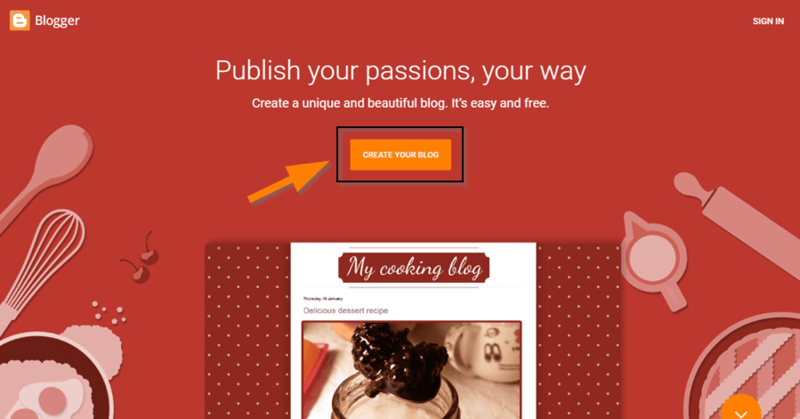 So, you want to create a blog for free and make money. Well, if you are interested in creating your blog for free then I will be jubilant to guide you. Most of the newbie bloggers find the starting time terrible and think that blogging is very hard and they need a lot of money to create a blog. But don’t worry I will tell you a very easy and straightforward method which you can follow to create a blog for free. Also read the Google AdSense Alternatives list. There are many sites which let you create a blog for free and make money online very easily. One of these online sites is Blogger. Yes, Bloggers is a blog publishing platform which provides the facility to create beautiful and stunning blogs for free and make money very easily. 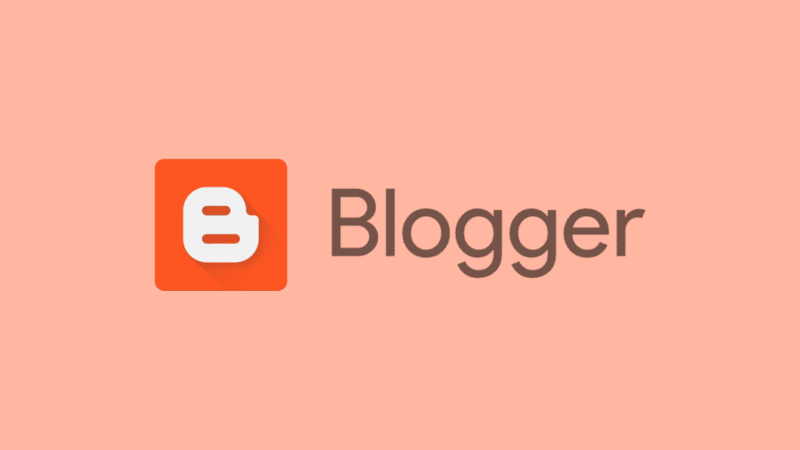 Since Google manages blogger, so it is entirely free for lifetime, and you don’t need to pay even a little penny. And the best thing about Blogger is that you can easily integrate Google AdSense with Blogger and can make a good chunk of money online by your free blog. 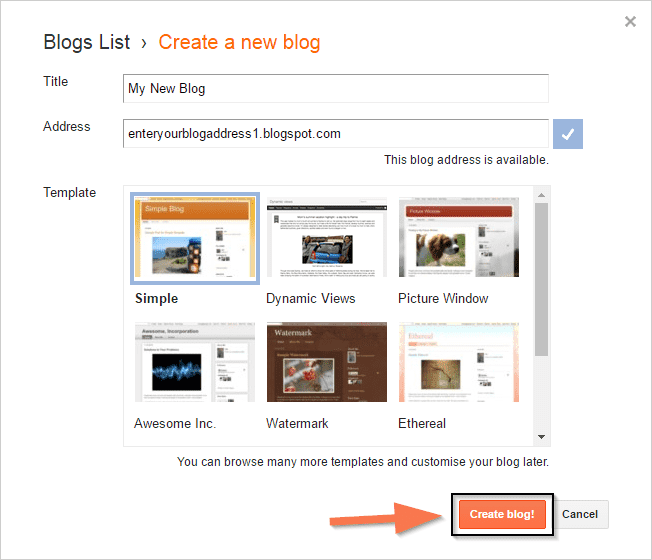 For Getting start with Blogger you just need a Google Account. If you Don’t know how to create a Google Account, then read Guide To Create A Google Account. Once you have a Google account, you can get started. There are a few steps which you can follow, and you will get your free blog after exact 5 minutes. So, sit tight and read the below stuff more carefully. Step 1. First of all login to your Google Account and go to Blogger.com. Step 2. 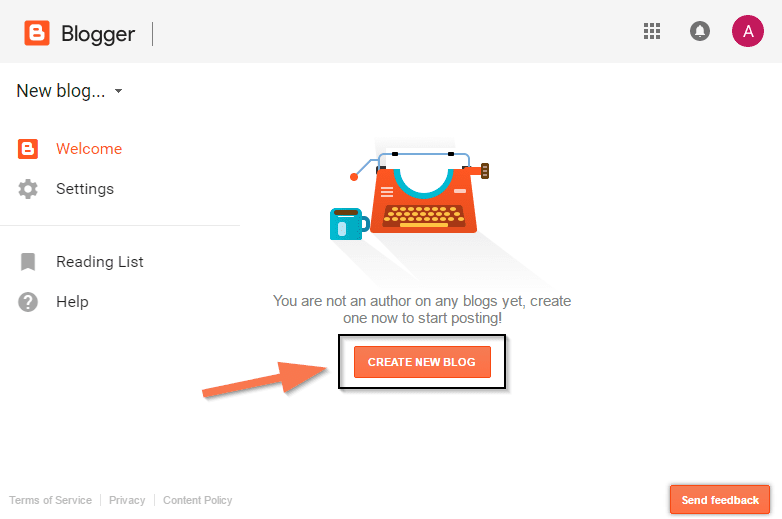 When you are on Blogger.com, click on the orange Create Your Blog button. Step 3. Now you need to create a Google Plus Profile. If you have already created a Google Plus Profile, then skip Step 4 and follow Step 5. Step 4. 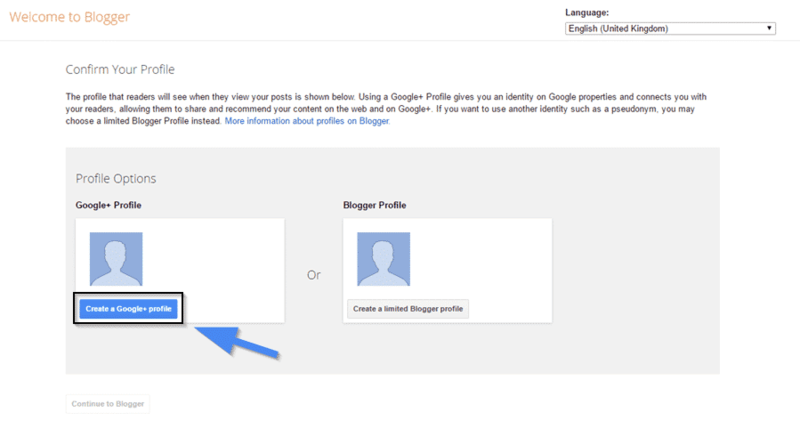 Click on the Blue button saying Create a Google + Profile and create your own Google Plus Profile. Step 5. Now click on Continue to Blogger button. Your Blogger profile has been created. Step 6. In the new page, click Create New Blog button in the center of the page. Step 7. A new popup will appear in this popup you have to enter a Title your blog Address and Template. In the Title field enter a title which you want, in the address field you have to enter an address where your blog will be live for example, you can enter your name, if that is available you will see a blue tick otherwise you have to change it. After that click on Create blog! button. That’s it you have successfully Created your blog for free. But there is a much more left. It is just your first step in blogging or even not. 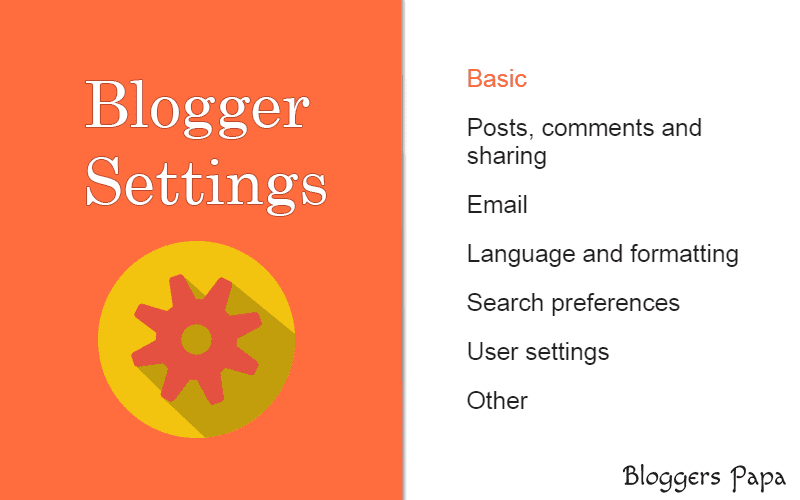 Now you have to do some important settings of your Blogger blog. There are many important Blogger settings which you should do immediately after creating your first blog on Blogger. When you do not do anything with these settings your blog follows the default settings and that’s not good for your blog’s growth. So, just follow the below-given settings for your blog. To get started login to your Google Account go to your newly created blog. On the left menu panel, click on the Settings and choose Basic Settings. There are two important Basic Settings which you should do. Under the title click on the blue Edit link and re-enter a suitable title for your blog. You can also choose a tagline with the title of your blog, for example, Bloggers Papa | Make Blogging Easy. A description is the most important part of the Basic settings because your blog’s description helps the readers as well as search engines to determine the main topic of your blog. To add a description for your blog click on the blue edit link and write about your blog. Google has clearly said that they are giving a ranking boost to the ﻿﻿s﻿﻿ecure/HTTPS Sites so, it is important that unless you setup a custom domain (more on this later) you should use HTTPS for your blog. This will help your blog to grow faster. Post, Comments and Sharing Settings are also necessary for the proper growth of your blog, and there are a few important settings related to Posts, Comments, and Sharing Settings. Comments Settings include all the features which are related to the comments on your site, for example, you can set who can comment, when the comment will be published, who will be notified about the comment and some other things. This feature allows you to stop the comments from unknown or unwanted peoples, but you should take care while doing these settings. If you want to create a private blog, then you can select only registered users, but if you are going to create your blog for earning money, then you should choose Anyone. This will help your blog readers to comment on your blog quickly. Comment Moderation is one of the most important settings. As the spam commenting is on its top, so people mostly comment on other’s blog and include their own links in the comments and when these comments go live without the permission of the blog administrators then your blog’s reputation is affected. So choose comment moderation to Always. You can also enter your email so that you get a notification mail in your email whenever someone comments on your blog. Sharing settings help you to change the sharing methods. This sharing method only includes Google + so you can only edit these settings here. You should share your each and every blog post on all social media networks because Social signals help you in boosting your traffic. By default, Blogger asks you for sharing your blog post on Google + whenever you press the Publish button I mean to publish a new post, but you can also set this step to automatic so that when you publish any new blog post that post is automatically shared on your Google + profile. Search Preferences settings are the most and most important settings of your blog, and you should do these setting very carefully so that you can get your site on the top of the Google in a very short time. Description Meta Tags are directly read by the Search Engines like Google, and these tags are very much important because Google and other search engines also use these tags for finding the niche of your blog. To add Description Meta Tags click on the blue edit link in front of the Description and select yes, then write a description for your blog up to 150 characters.Note: This description must include all relevant keywords of your blog and should make sense to the readers to. Crawlers and indexing settings are also important, and if you do these setting wrong then you may find your blog out of the range of the search engines, and this is clearly said by the Blogger. 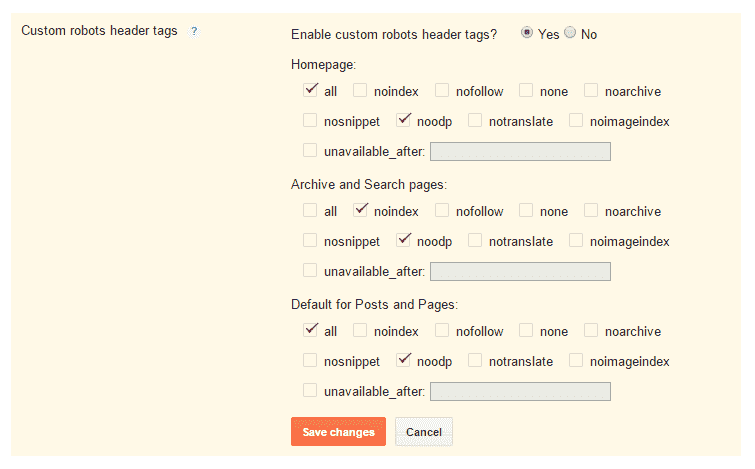 Here in this section, we will just edit the Custom robots header tags options. You just don’t need to understand these setting. Click on the edit link and select yes. Tick the options like below given image and save settings. That’s it you have setup your blog successfully and have also done the necessary settings for your blog. Now our only one step is left, and that is making money from your blog. ​My dear readers all of this which you have done till now is just the beginning or say the first step of your Blogging journey. If you are really interested in making money from your blog, then you have to work much more on your blog. Because making money from your blog is not that easy. But don’t worry As the title of this post is How To Create A Blog For Free And Make Money and this title includes the words Make Money so, I will not disappoint you. I will tell you about some best methods to earn real money from your blogs. Recently I have earned $50 by monetizing my one site, $28 by partnering with an advertising company and $350 by selling my site. Yes, all of this is genuine, and you can also earn money by working on your blog. Well, there is not only a single method to make money online. Instead, there are many ways to make money online and especially from your blog. Below I have listed some best ways to earn money from your blog. Google AdSense is the best method to make thousands of dollars from your blog. Believe me, you can make hundreds of dollars daily from Google AdSense. The working of Google AdSense is very simple, when you create a high-quality website you can apply for Google AdSense if they approve your AdSense account you have to place an ad code on your site and some advertisements will start displaying on your blog. When anyone clicks on these ads, you will be given money. Affiliate Marketing is, even more, better than Google AdSense. Because for Google AdSense, you need a very high-quality website, but for Affiliate Marketing you don’t need standard quality. You can start affiliate marketing even from the first day of your Blogging Journey. In Affiliate Marketing you offer your blog reader other’s products or services when your blog readers buy or signup for the product you offer them you are given a commission. Some companies offer you a commission on free sign up while some give on the paid subscriptions. Product referring is somehow same to the Affiliate Marketing but in this online earning method you don’t force your reader to buy the product. Instead, you offer them to signup for a particular service by which they can earn money. For example, many blog monetization sites like Media.net provides a referring feature by which you get a commission of your referred person’s earnings. So, friends this was all about How To Create A Blog For Free And Make Money. In this guide, I have covered about everything which was important for you to start your own blog for free and start making money. As you are new to this field so you will find this a bit harsh but don’t worry I will guide you in everything which you may have the need.